By the time I got to Grenoble I was three days ahead of schedule. Because friends had booked flights and were expecting to meet me at a particular place, I had to lose some days. Some friends near Grenoble had offered to put me up so taking a few days out made a lot of sense. I finished walking on the Wednesday and was back in Grenoble lunch time on the Saturday. It rained almost continually for the three days so my timing for once was impeccable. Getting to the Swiss border, where the E4 turns firmly east, involves a journey of some 245 kms, 10,500 metres of climb and 9110 of descent. It took me 9 days with some long days where the accommodation was a bit limited. You can break the walk down into three parts - a really dramatic, and tough, first three days through the Chartreuse Natural Park; a gentler central stage which eventually takes across the Rhone (for the second time, with the Rhone now flowing east to west and out of Lake Geneva); and finally an upland section the last couple of days of which are in the Haut Jura Natural Park. 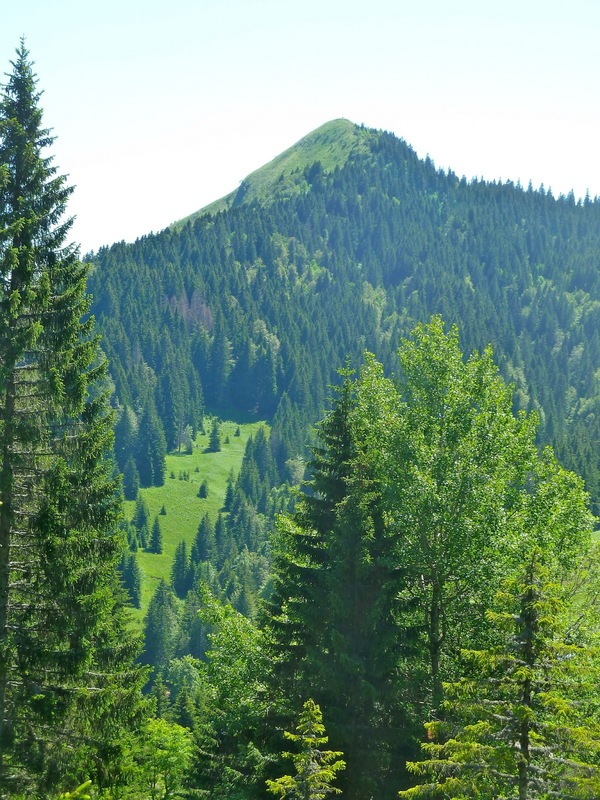 The Chartreuse Natural Park is built around the Chartreuse Massif which is the mirror image of the Vercors on the southern side of the Isere valley and shares the same dramatic limestone scenery. Grenoble sits strategically in the gap between the two. I was walking out of Grenoble at about 2 in the afternoon, it was drizzling which was a big improvement on the morning, and the day was getting better. The route took me up past the Grenoble's imposing Vauban fortress (there is a lift option), along a ridge and then down to the little village of Le Chateau Pillon before a very steep climb up to another fort, the Fort du St-Eynard. 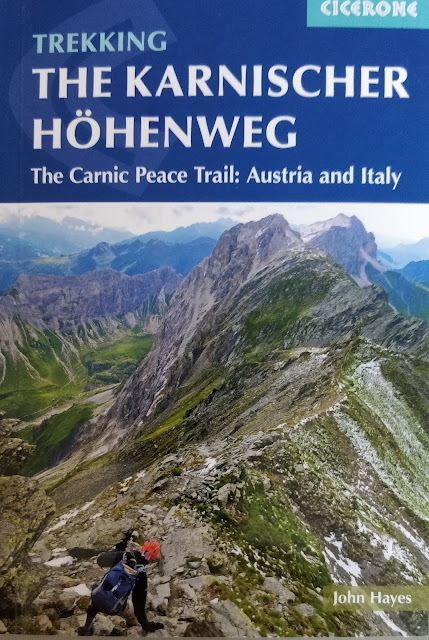 This was followed by another lovely ridge walk through trees but with occasional views from the edge to huge mountains on the other side of the Isere valley. The route then drops down to the ski resort of Le Sappey en Chartreuse where I stayed at the Hotel les Skieurs, very nice but way above my budget. A good walk, not very far but at least 1400 metres of ascent. Th next day's walk was brilliant and one of the best of the whole trip. The weather was drizzly in the morning but again got better as the day went on. It started with a gentle walk up the valley along a muddy road to the foot of a cliff underneath the 2,000 metre Chamechaude. Crossing the valley to the east, climbing a gentle ridge you then drop down to the Col de Coq before climbing up the side of the very impressive Dent de Crolles. It was Sunday and there were lots of walkers out and there was a short queue to get onto the rope which you used to pull yourself up. Leaving the crowds it was then a long descent before climbing over another ridge at the Col de Bellefond. Great views of Mont Blanc followed by a long gentle descent along a limestone valley before turning west towards La Plagne. Stayed in a brilliant Gite d'Etape at La Plagne. Next day was the last day in the Chartreuse, a nice walk but not brilliant with quite a lot of road walking. You do visit some pretty villages (L'Epernay and Les Bozons) and pass through the pleasant Gorge de L'Echaillon before dropping down to Les Echelles. Couldn't find accommodation in the town and stayed some way out at Auberge du Morge. Three days in the Chartreuse is then followed by couple of gentle (not flat) days as the GR9 and E4 crosses the Rhone Valley. 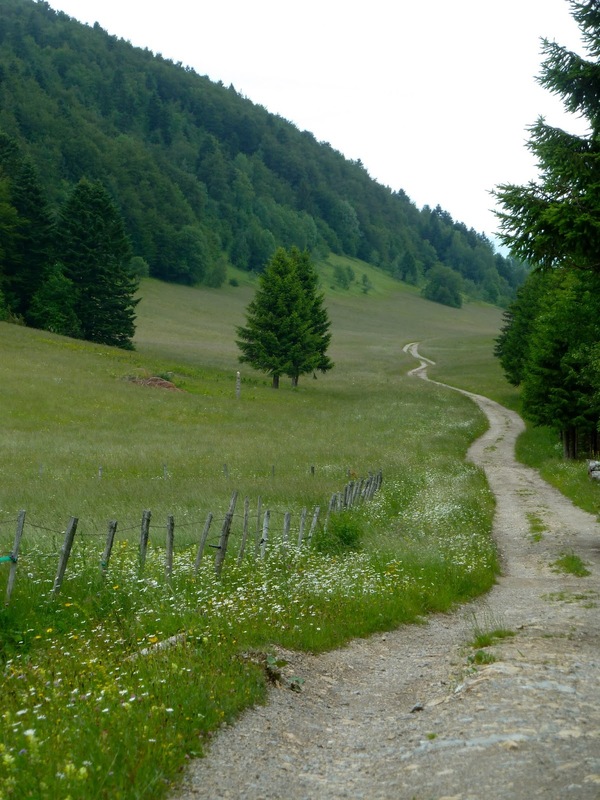 I rejoined the path proper at Attignat-Oncin with the route taking me along quiet country lanes and across meadows. At the little town of la Bridoire it gets a bit more built up but your soon back onto those quiet country lanes before climbing onto a ridge (just after the village of Dullin) which takes you all way to St Maurice de Rotherens. A autoroute runs underneath the ridge and there's a motorway hum in the back-ground but the ridge gives great views of the Rhone Valley. The Gite d'Etape at St Maurice de Rotherens is an absolute classic, awful beds, great food and great fun. There is a tributary to the St James Way around here and the owner has built a chapel to promote the fact. The walk next day was a lovely one spoiled a bit by mixed weather. Continuing along the ridge above the Rhone Valley you eventually drop right down to its banks at Yenne (the Rhone actually splits following either side of a large island). Climbing up again, away from the Rhone and through vineyards (the GR9 is sharing the same route as the GR65, the St James Way tributary) you then return to the river at the pretty town of Chanaz before crossing the Rhone just in front of Culoz. It was pouring with rain and I glad to get to the Hotel le Cardinal which was cheap and cheerful. I could have stayed at the prettier town of Chanaz but I wanted to be as close as possible to the Grand Colombier. Climbing up to 1500 metres and walking 30 kilometres felt like a challenge but the Gite D'Etape at la Grange d'en Haut was shut and the only choice was to walk onto the ski resort at Les Plans d'Hortonnes. Really good stretch of walking, a lovely mix of upland meadows and trees spoilt only by the mixed weather which restricted the views. Stayed at the excellent Hotel Berthet . Much better weather next day but for once the scenery was a little dull, high up but either in trees or on fairly ground. A long knee crunching descent down to the motorway and just beyond that to the little ski resort of St Germain de Joux. Stayed at very nice but expensive Hotel Reygrobellet. Great weather the next day, scenery a lot better but still an awful lot of trees, just a bit frustrating given that the dry weather had recently been in short supply. After climbing up out of the valley and visiting the pretty village of Giron (could have stayed there), there was a sustained forest walk, some pretty meadows, but mainly trees and it doesn't really open up until the last third of the walk and the descent down to the little ski resort of Lelex. Have lost the name of the hotel I stayed in, a shame because it was very good. The good weather continued next day, and climbing up the onto the Jura Ridge proper, I was rewarded amazing views of Lake Geneva, the Alps and Mont Blanc in particular. An absolutely fabulous walk along the ridge all the way to the ski resort at the Col de la Faucille where I stayed in the Hotel de la Couronne. On my last day in France I went the wrong way. I stuck with the GR9 went on a huge detour to La Cure where I crossed the border and joined the GR 5 and walked to Saint Cergue. A comment on the web-site suggested I should have carried on along the ridge (now back in trees) along the GR Balcon du Leman. This would have taken me over La Dole, where I would have got some great views again, and then down to Saint Cergue. An annoying way to finish the trip through France.